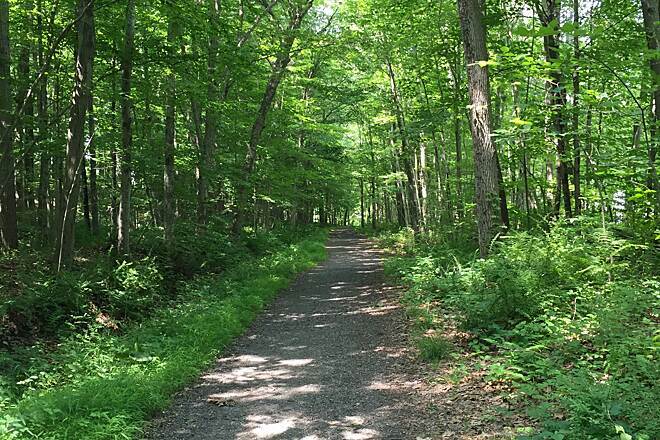 The Larkin State Park Trail meanders 10.8 miles through the woods and around the lakes and low hills of southwestern Connecticut. 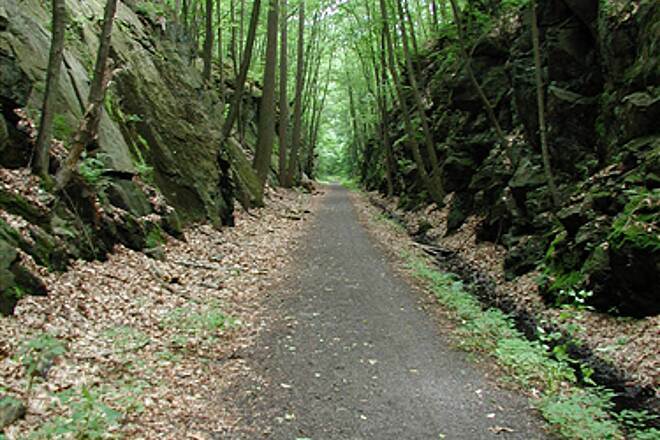 The rail-trail follows the route of the New York & New England Railroad, founded in 1873 (with this section built in 1881) and succeeded by the New York, New Haven and Hartford Railroad in 1898. 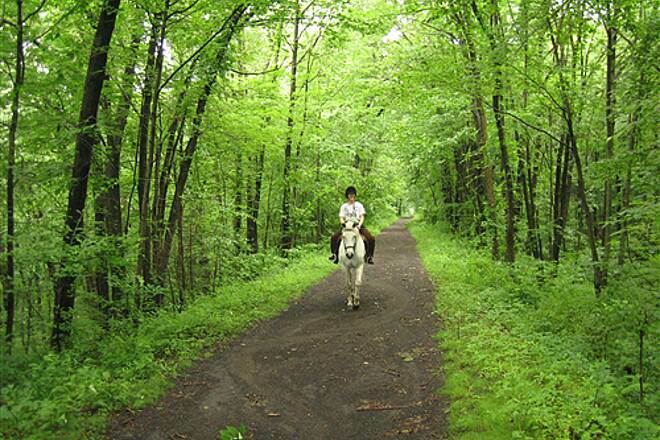 The trail’s former name—the Larkin State Bridle Trail—attests to its origins as an equestrian trail. A local surgeon, Dr. Charles Larkin, bought the disused railbed and donated it to the state in 1943. 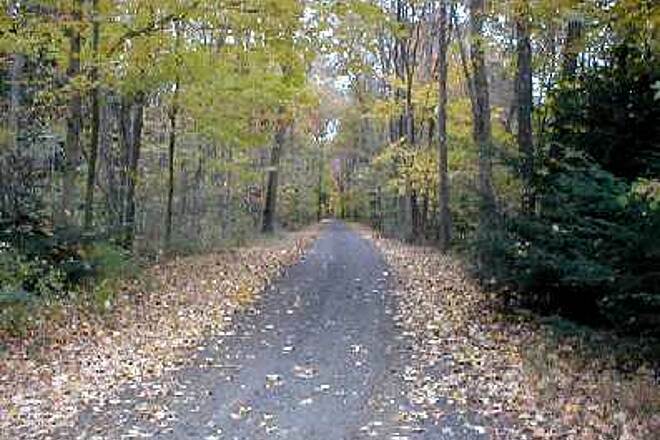 Horseback riders use this trail frequently and have the right-of-way. Bicyclists should remember to approach horses slowly and quietly, speaking softly and taking cues from their riders. If necessary, dismount on the low side of the trail, as horses instinctively fear anything that might pounce from above. 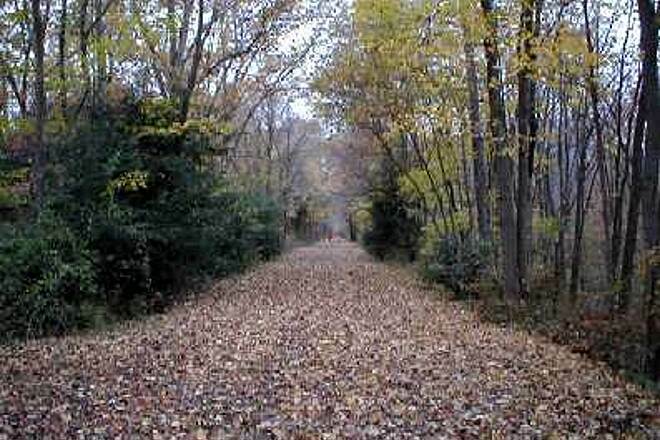 While railroad builders avoided steep hillsides with a serpentine route and railroad cuts, the trail slopes gently uphill from each end to the high point at Prokop Road/Riggs Street in Oxford. The path also ascends or descends steeply at some road crossings. While the trail’s surface is typically firm, sections in the west can be rough or soggy, making mountain bikes or hybrid bikes with wide tires a preferred choice. 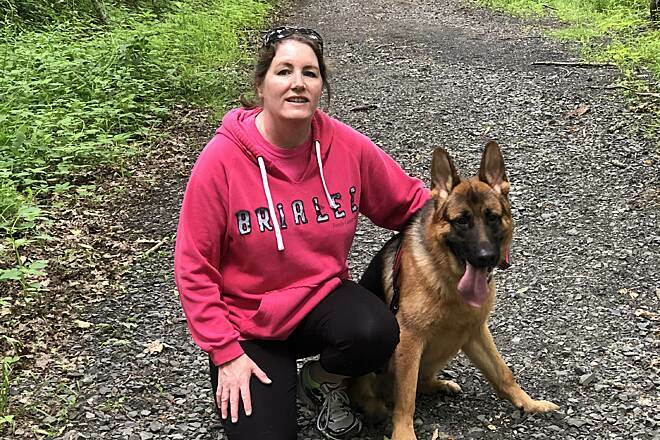 Even though the trail rolls through the outskirts of the Colonial-era towns of Naugatuck, Middlebury, Oxford, and Southbury, there are no services along the trail, so stock up with food and water. 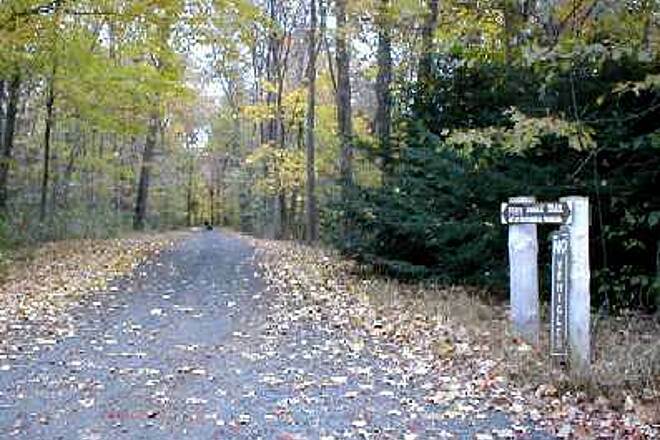 Starting at the parking lot on CT 63 in Naugatuck, you’ll pass through heavily wooded Whittemore Glen State Park. Forests border the route most of the way to the trail’s end in Southbury, making this an ideal destination for leaf-peeping in autumn. 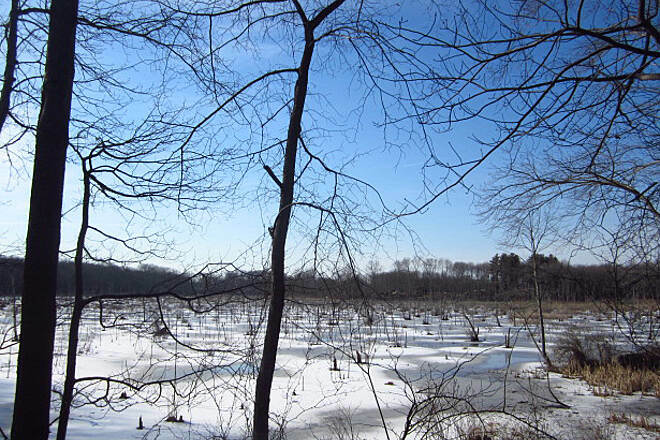 After nearly 4 miles, the trail passes the southern tip of Long Meadow Pond, inaccessible behind private properties. At Long Meadow Road, you’ll briefly leave state-owned property for a 0.5-mile on-road detour around a privately held stretch. Turn left onto Long Meadow Road and right onto Towantic Hill Road, then watch for trail access on the left side of the road. 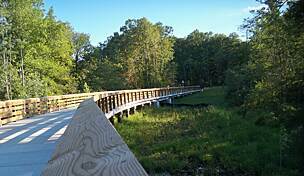 Back on the pathway, you’ll get views of Towantic Pond’s boggy shoreline and pass over wetlands on a causeway. 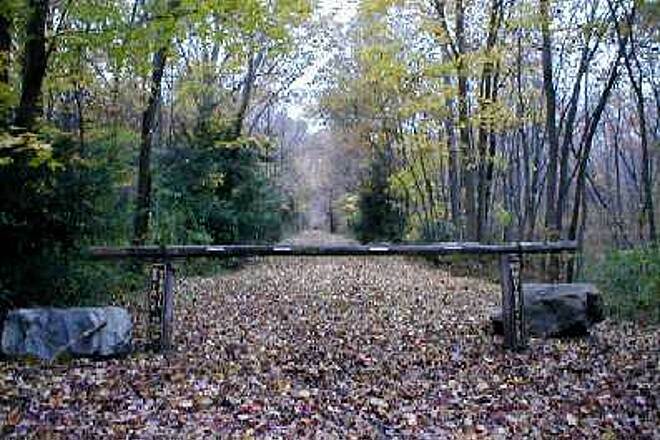 The trail brushes the southern end of the Waterbury-Oxford Airport at 5.7 miles, and then passes through more woods on its final run to Kettletown Road in Southbury. To reach the eastern trailhead in Naugatuck from I-84 W/Yankee Expwy. southeast of Waterbury, take Exit 17 onto CT 64/Chase Pkwy. Go 0.3 mile and turn left onto CT 63/Straits Turnpike. Go 2.5 miles and look for parking on the right at the sign for LARKIN STATE BRIDLE TRAIL. From I-84 E, take Exit 17, and turn right onto CT 63/Straits Turnpike. Go 2 miles and look for parking on the right at the sign for LARKIN STATE BRIDLE TRAIL. 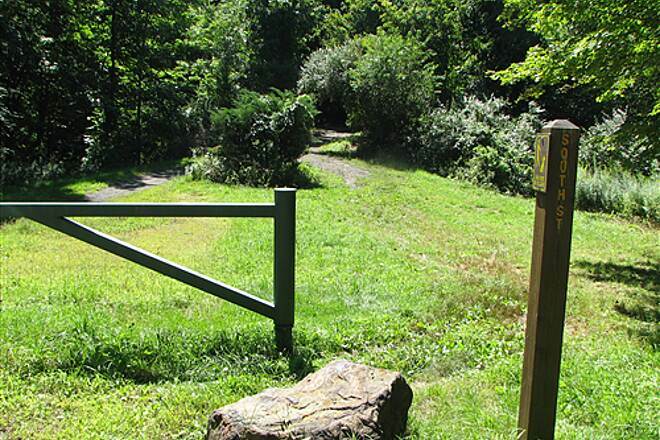 To reach the western trailhead in Southbury from I-84/Yankee Expwy. east of Waterbury, take Exit 16 and turn left onto CT 188 S/Strongtown Road. Go 2.5 miles and look for parking on the left. The trail ends 2.4 miles west on Kettletown Road. Great ride but especially by IBM and where there is an active rusty river flowing there needs to be work done. Just got my new gravel bike and this trail was a perfect bridal (horse) trail ride.Mud ,cinder,dirt and gravel are what you will encounter ,but the high berms,ponds and deep woods experience are worth the trip! The description of the trail talks about the detour using Long Meadow Rd. and Towantic Hill Road. There were no signs on the trail itself to tell you this detour was in place, and no signs on the detour roads. I could not find re-entry off of Towantic Hill Rd. I continued on the road until Riggs St. where I rejoined the trail turning right, west, at that point. Didn't do much of the west end west of Rt. 67, it really was quite rocky. There were a few soft spots that were a pain, but mostly it was a quiet shady ride. I drove about 50 minutes to the trailhead in Naugatuck and from the parking lot, the trail rose about 40 degrees and was rough and covered with leaves. Perhaps it smooths / levels out a bit later, but it looked as it it were suitable for a mountain bike only. I drove to another trail. My friend and I rode the trail at the end of January. I definitely recommend fatter tires. The trail was very mucky and slushy overall. There were some dry areas and some icy areas. This trail is unlike many rail trails, as it has some decent hills. There are no services nearby. If you follow the I-84, Exit 16 directions on the RTC page, the trailhead is tricky to find. You'll pass by a curve on 188 with yellow arrow signs. 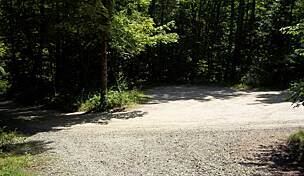 Within the next eighth of a mile, the trailhead parking lot will be on left, right after the Southford fire station. There's room for about 12 cars. This is our first experience on this trail and we were so grateful that we decided to try it out. The canopy of the trees provided enough shade to keep us cool on a very warm day. All you can hear are birds calling to one another & the rustling of the leafy carpet as squirrels run through. We did see some large paw prints that were of a beR nature but no bears were sighted. Can't wait to return. Rode the trail from the entrance close to the Route 188 / Route 67 intersection to the Eastern end of the trail (Route 63, about 7 to 8 miles one way). The trail was in good shape for the most part when I rode it (it has been a fairly dry August). Having said this, the trail is probably more suited for a mountain bike (what I was on) vs a hybrid bike. - Besides some rubble/roots etc. in some places, the trail also has a few sections that are largely sand (fatter tires work better). - Some of the road crossings need some work (steep incline or decline with rough terrain as you get to the road crossing). - The trail could use a bit more signage. Overall, I was pleased with the trail and will ride it again! We found the parking lot pretty easily. There was a sign saying it was the Larkin State Bridle Trail. From the parking lot you had to go up a semi-steep short trail to the bridle trail. We rode the trail with our mountain bikes and there was only one downed tree that was easy to carry your bike over. I think it added to the fun. We really enjoyed the part of the trail that went between the rocks like a small ravine. There were exposed tree roots growing on the sides of these rocks and moss on the rocks. It was really beautiful! The rest of the trail that we rode on at least was pretty much the same. There were trees, a few ponds, and some houses. Watch out for the horse poop on the trails since it is a bridle trail. Trail needs so TLC after this summer's storms. Hurricane Irene and some of this past summer's rain storms have left a mark on this trail. Trees down and trail erosion. Some trees have been cleared from the trail, but there others to be removed. 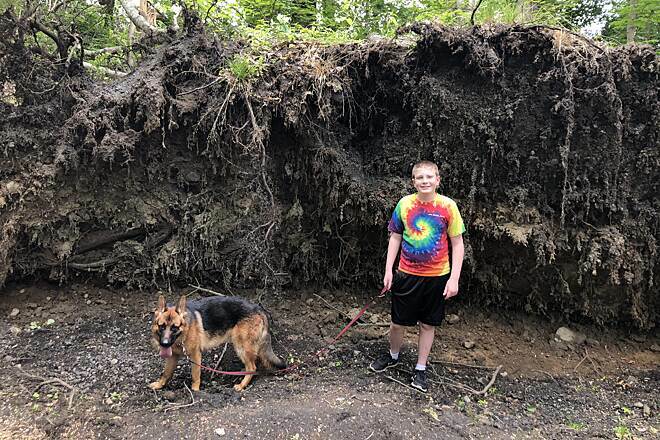 There's a huge sink hole on the Southbury section where the horse farms are. If you're bike riding be careful of the sand and ruts in the trail, also be careful when you pass though the water. This is a wonderful trail that is in need of some TLC. 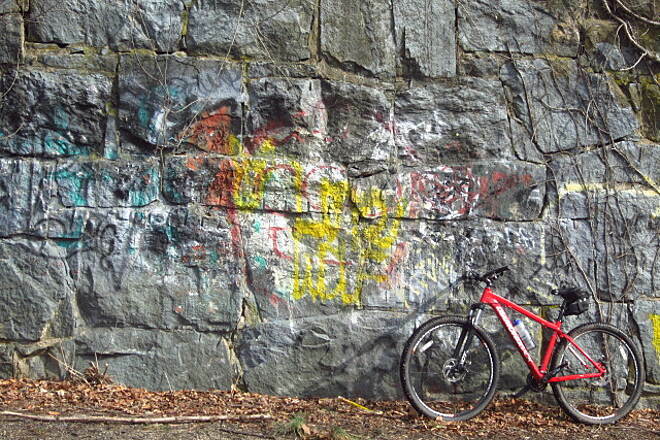 Is there a trail committee that maintains the Larkin or is the State of CT responsible? If anyone know the answer please post as I'd love to help out. Thanks. Rode the trail from rt188 to the dam and back. A little over 17 miles on the flip flop. This trail is flat most of the way and should be enjoyable for beginners also. The weather was great and the trail was a blast. Although I did enjoy the 150 foot through the water the rest of the trail was pretty mello. 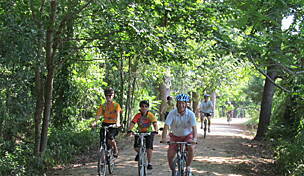 I will surly bring some beginners here to get a taste of biking in the woods. The trail is hard packed and scenic and well worth a 2.5 hr burn. Rode the entire trail from Route 63 in Naugatuck to Southbury and back this passed Sunday (6/19/11). Great ride all the way through. Did it in just under 5 hours, which included 2 breaks for about 20-25 mins each, quite a few short breaks due to a friends knee issues and one stop on the way back when his bike broke. Some rough sections best suited for mountain bikes with front or full suspension. But doable with most other bikes as long as the rider is careful. 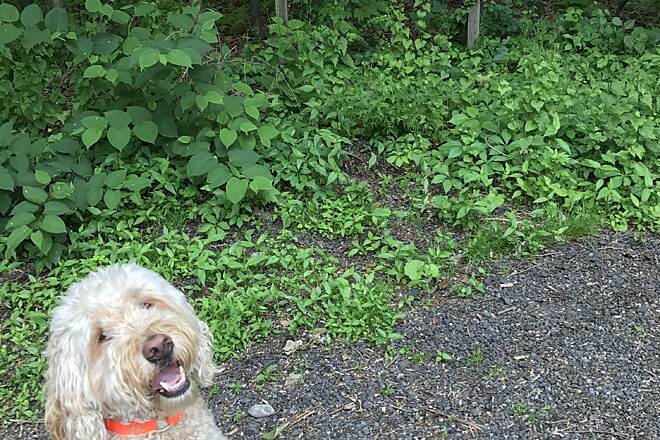 Some areas closer to Southbury are a bit overgrown, so make sure to check for ticks after passing through. Nice views throughout and overall a very nice ride. My husband and I enjoy riding this trail. We park at the lot on Route 63 in Naugatuck and ride to the end in Southbury. The trail can be rough and rocky in spots and I wouldn't recommend riding the trail after a rain storm, but our hybrid bikes ride just fine on this trail. You do have to dismount at some of the street crosses as they can be steep and rocky. Watch for cars when crossing roads. Horses do use this trail so remember to approach slowly and quietly and give the right of way to them. So pack your lunch and give this trail a try. Started from Rte 188 and headed east on my non-suspension mountain bike. All was well until I crossed Towantic. It was almost impossible to traverse the rusty colored muck which lasted about 100 feet. (worst I've ever seen it) After that it was smooth sailing again. On the return trip I took roads to avoid the muck n' mosquitos at Towantic. All thats needed is a drainage ditch but from what I'm reading its in the hands of a private landowner. Later I did the short section from 188 towards Kettlletown Rd. Its very rough just after you cross Rte 67 then it improves. I created a cue sheet for rides I plan to lead on this trail. These are my recommendations. While talking to an equestrian, I got the inside scoop on the private section of the trail. She said that it's owned by a man who does not want to sell it to the state, but he does not mind people riding on this section. Unfortunately every time I have ridden the section, it's underwater, which is why I recommend taking a bypass on the way back. I also recommend bypassing the washed out section near Rt. 67. It's much easier to take Rt. 67 than to ride this rough section of trail. Directions, Maps, and Parking: Start at the main parking area on Rt. 63. Take Rt. 8, Exit 27 to Rt. 68 West to Rt. 63 North. Go 1 mile on Rt. 63 North. Look for sign “Larkin State Bridle Trail.” From I-84, Exit 17, take Rt. 63 South. Just past Waterbury/Naugatuck line, lot is on right side. Maps: www.bikekinetix.com/images/ct/ mapsct/larkin_bridle_rt.gif or http://www.ct.gov/dot/ and do a search for “Larkin Bridle Trail.” The trail is described on multiple pages, which are included in the book Pathways Through Connecticut. The book may be purchased from the Conn. DEP store. From http://www.ct.gov/dot/, do a search for “Pathways Through Connecticut.” The paved parking lot holds 20 cars. The only other trail crossing with parking is on Riggs Rd. where 8 cars could be parked. In Southbury, parking is available in the CPL off I-84 Exit 15, but requires biking up the steep hill on Kettletown Rd. Off Rt. 188, there are shopping centers with available parking. Trail Notes: Due to the varying trail surfaces, a mountain bike with suspension is recommended. A hybrid with its narrower, harder tires is likely to give an uncomfortably bouncy ride. From Rt. 63 heading toward Naugatuck, the trail is moderately to slightly uphill until about mile 5.7 (near Christian St.), and then is moderately to slightly downhill toward the end in Southbury. The trail is entirely unpaved with a surface that is cinder or hard-packed dirt. Some trail sections have a washboard surface created by the horses’ hooves digging up the trail. The section between Longmeadow Rd., and Towantic Hill Rd. is privately owned and unmaintained. There is usually water running across about a 0.1 mile section of the trail. Most road crossings are at grade level and have little traffic on them. Some crossings have a moderate climb. Steep and busy crossings are noted. Dogs are permitted, but must be leashed. Mountain biking is permitted. 0.90	Cross	Allerton Farm Rd. 4.10	Water over trail. Ride through it. 4.25	Cross	Towantic Hill Rd. 9.00	Next left	Curtis Smith Rd. 10.20	Cross	Jeremy Swamp Rd. (VERY steep descent to Jeremy Swamp Rd. 10.65	U-Turn	Trail ends at Kettletown Rd. 11.10	Cross	Jeremy Swamp Rd. 12.20	Left	Curtis Smith Rd. 12.30	Right	Rt. 67 (busy road) at T-int. (Walk bikes down slope. Steep and narrow). 15.60	Trail begins gradual descent. 17.15	Right	Towantic Hill Rd. (Steep, curvy descent. Control your speed). 17.55	Bear Left	Towantic Hill Rd. 17.70	Left	Gunntown Rd. at T-int. 18.71	Next Rt. Hill Rd. 20.75	Cross	Allerton Farm Rd. *** If you want the shortest distance back to the trail, turn left on Long Meadow Rd. and go 0.40 miles, then right on the trail. It’s a steep climb with 100 ft. of elevation gain for a grade of 4.7 percent. We rode the trail October 7th, 2007. Trail surface and conditions varied from compacted stone dust to grapefruit sized rubble and everything in between. In spite of an extended dry spell one section was muddy although this mud was hard packed and didn't create any problems other than dirty sneakers. In many places the surface transitions from compacted screenings to deep non-compacted screenings (that look just like the compacted ones). The result is a bike that stops without warning. The trail follows the railbed for it's entire length although a short portion between Route 67 and Curt Smith Rd is mostly softball size and larger rocks. On the return trip we detoured over roads. It's interesting to note that the trail's only crosswalk is being built across Route 67 at this point. The only official parking lot is on Route 63 at the east end of the trail in Naugatuck although there are impromptu roadside areas big enough for 2 or 3 cars at most places where the trail crosses roads. Many of these road crossings are complicated by not having bridges and often require a steep portage over boulders down to the road and then back up to the trail. Railroad bridge abutments still exist in many places I imagine it wouldn't be too big of a deal to install bridges at these locations. "Rode this trail for the first time in a year. Same flooding problems and this time there was a lot more sand to bike on, that seems to have been uplifted from under the ash and cinder. A real pain. Great trail, but lots of maintenance is needed. Then again, there was 2 weeks of rain." "We road east from Rt.63 and back. We did find the start after a little confusion. If you are getting off Rt.84 and heading south. 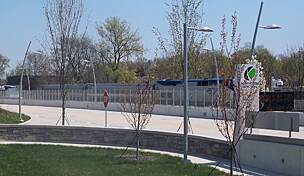 go by the first entrance to Hop Lake park and after two lights start down hill by the dam. About 100 yards on your right is parking. From this end it is up hill for about half the trail to Rt.188 and down hill after. 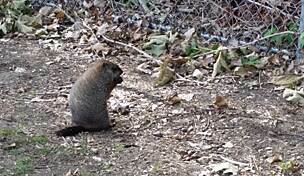 It seems that the beaver problem is fixed and the trail was dry and really great for the first one third. It got more challenging and rough as you encountered more horse traffic. I was wondering if a horse could drag a sled to smooth out the trail occasional. On the air Line South I saw a ATV doing this on the same type of surface. It would make it better for all users. We decided not to continue after Rt.67 as the start did not look all that great and went south on a very buzzy Rt.188 and found a deli next to the ski shop for lunch. No place to set and eat, but they said there was a little park just up the street. The return trip was up hill for about half and then a fast top gear run back to Rt.63. " "I took Route 84-East to Exit 15 and then took a left off of the exit and then turned right into the K-Mart Shopping Center. There are other establishments in the area, but I figured that the K-Mart was the best place to park. There also is a bike store on the left before the K-Mart. I took a left out of the parking lot and then the first right hand turn onto Kettletown Road. You will have to go up quite a steep hill till you come to the top of the hill. There is an IBM building on the right hand side of the road. I went into the IBM complex, maybe I shouldn't have, but it was a weekend and no one was at the guard gate. I was trying to find the other end of the trail. I just assumed it would be on the far side of the IBM property. It was also very hilly in the IBM complex. I did find an opening and clearing but it was loaded with no entry, gas line signs. You could clearly see in the distance a path cut through the open forest. I think this was the old rail trail that I was looking for, but I was already on IBM's property and I wasn't going on any gas line trails either. I would NOT recommend anyone else going either. Anyway, I went back to the entrance to IBM and the Larkin Ridge Bridle Trail is directly opposite the entrance to IBM on a little embankment. I was on this trail last September and it was extremely muddy. This time the trail was in very good condition. I took it all the way to Naugatuck and back. I ran into another biker who told me that last year the beavers had made a dam that had caused the extensive flooding and all of the resulting mud. I was pleasantly surprised to see most of the mud gone. There was still a small stretch of mud before you come to Route 188, but you could still get through if you kept to the right. There were some spots where the trail got sandy, but you just have to move over to the grass and then back on the trail when the ground would get more solid. The entranceways between the roads were clearly marked, but some of the entrance and exits, you really have to clamber up some rocks. But to me the trail was worth it. The trail itself is almost, if not all through the woods, and quite relaxing. You pass some swamps and a good sized pond. There were parts of the trail where I could get my bike up to 15 MPH but most of the time I was going slower and enjoying the forest. It is buggy if you stop, but if you don't stop the bugs have a hard time keeping up with you. Please remember that the horses do have the right of way and you should always stop till they pass, or the riders wave you through. You will have to dodge the horse poop. There are quite a few piles and I would imagine that after a good rain this could be a problem. All in all I thought the trail was excellent. I took quite a few pictures and I would recommend the trail to anyone with a mountain bike." "I consulted a trail book before the ride and it said the best route was East to West as the last few miles are at a downgrade. If you are starting in Naugatuck (eastern end), it's exit 17 off Route 84 and then you go south on 63 for about 2 miles. You will see the entrance on your right and there's a small lot that can fit 10 cars or so. If you feel adventurous and don't own a car, take this route. Take a Bonanza Bus (www.bonanzabus.com) to Waterbury. The trailhead is 4.2 miles from the bus station. At the bus terminal at 188 Bank Street, head south on Bank for a mile or so, turn right on Congress and this will be a huge climb of a few hundred feet (a nice start off to the morning), then a left on Highland which turns into Spring and leads you into the country on a 1.5 mile descent. Right on Porter (street sign is not there but if you pass the Naugatuck PD, you've gone too far. Then a left on North Church (Route 63). The trailhead lot is on your left. If you go up the street a bit there's Hop Brook Lake including 300 acres of playing fields, reservoirs, beaches, lakes and miles of trails. With your back to the trailhead, look across the street and there will be a clearing (reservoir drainage) but up on the hill/horizon it looks like the railbed continues. For those adventurous types like me, jump the guardrail and proceed to that spot. It's double track for 100 or so feet before turning to single track and this conceivably cannot be the railbed because of the very steep slopes and narrow trail. This is part of the parks system. The trail is a combination of either crushed ballast, gravel and cinder but at times is pretty demanding on the legs as it gets pretty sandy after the first out bridge. You will hit Longmeadow Road in Oxford near another out bridge and there will be a ""shanty"" house in front on your left called ""Duleyville"" probably the name of the family who lives there. To the left is a run down house with a run down car in front to the left of the trail. After this house and the climb up to the trail it gets treacherously muddy, with lots of flooding and wetlands on both sides. Then stop and walk your bike up the rocks on a steep incline to the road and cross. After the powerlines, stay to your LEFT side, riding along the grass line as there is enormous flooding. CT has had rain for 2 weeks straight and this has no doubt led to massive flooding and will be hard for the DEP who maintains the trail to fix. The water becomes a river that flows in the middle of the trail and it at the end before it turns right off the road, it has eroded the paved portion so much that there are huge pits. The next road you come out on is Strongtown Road and there is a work garage on your left. You can relax on the flatbed for a snack. Between this road and the next one (Southford Road) there is more massive flooding. It gets so bad, your shoes will sink and get wet and this lasts for a good 750 feet or more. It's quite unenjoyable. Here it's a stream for a short while and becomes a nice ballast trail for a good while with some nice straight-aways. Even though there are no cars allowed on the trail, they are in one spot, the next one as it becomes Curt Smith Road. There is a development of 3 houses and that street has cars exit it which is still the trail, but it dumps them on the intersecting street. Kind of weird. There is another out bridge and you will climb up rocks again. There will be a clearing as a shocker of light and just up ahead you will see a traffic light and this is where the trail ends, at Kettletown Road right across from the Southbury IBM. If you were to follow the old railbed across the way, it's quite tough. I scouted it on foot and it would have to cross and go up a steep embankment. The trail is still there and it goes uphill on a 30 degree angle. One day I'll hike it and it is overgrown. I decided to head back to the Southbury station to catch the bus and i made a right off the trail on Kettletown and then a left at the light on 67/Route 6 East and then followed Main Street for 2 miles to the bus station at 999 south main street. Parking is not to be found in this area but as someone posted before, 188 is not the best place as you still have to travel a few miles. My way is like that but it may be another alternative. There is a small park and ride (don't know if it's legal for trail users) but that's right by the highway near the end of the trail, at exit 15 but there's a much larger one up ahead at exit 14. If you park there, it's either a .5 mile commute or a 1.5 mile commute on street. The trail really is beautiful with 95% tree cover for the whole ride and there are wetlands, streams, brooks, trickles and lakes. Quite serene. Even though there are neighborhoods along the whole way, it's still very quiet, except for the occasional small waterfall." "There is no partking in the fire department lot on Rt. 188, and the eastern end of the trail has a huge puddle following recent heavy rains." "I aggree with other people: avoid the beginning of the trail. Take Exit 15 to RT 67 South towards Oxford. At the Rt 188 intersection, turn left onto Rt 188 (traffic light), travel about 1/4 mile and park at a firehouse on the right. Then travel away from the Rt 188 road, behind (sorta) the firehouse." 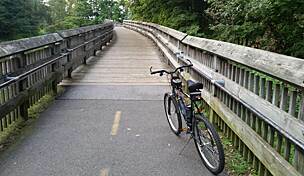 "Taking the advice offered by an earlier reviewer, I avoided the perpetually muddy trail surface between Routes 67 & 188 in Southbury and concentrated my efforts instead on those trails segments east of Route 188. I parked near the Southbury Fire Department sub-station on Route 188 and headed northeast towards this trail’s terminus at Route 63 in Naugatuck. 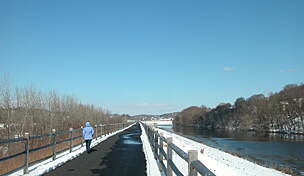 Trail surface conditions between Southbury and Naugatuck varied from excellent to mediocre. Most of the surface I encountered was hard-packed ballast, but there was some loose ballast in a few spots as well. 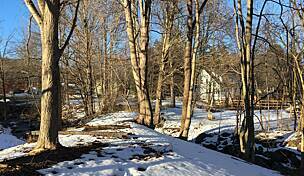 An active streambed occupied about 1000 feet of trail surface near the Oxford Airport. However, the right-of-way in that area was wide enough to permit me to ride the grassy trail shoulder. Also, approaches to many of the street crossings were very rocky and uphill. This most likely due to the fill required when roads were being constructed through newly populated areas long after the railroad line had been abandoned. 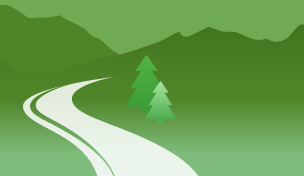 The entire route is heavily tree-lined, which should offer trail users a cool respite in the dead of summer. Views along the trail were quite pleasant; highlights included two beautiful ponds, some lovely estates, and many open fields. 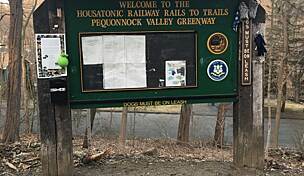 It doesn’t appear that the former railroad had any commercial or industrial customers between Southbury and Naugatuck; I saw no evidence of any old sidings or factories. Although I noticed only one dedicated trail user parking lot as I was riding, on Route 63 in Naugatuck, there are many ad hoc places to park where the trail intersects local streets. Just make sure you keep the trail access gate clear for emergency vehicles. This is a great trail for equestrians, firm-footed hikers/walkers, and confident bicyclists riding mountain bikes with wide tires. It is indeed worth driving from afar to take a journey here." 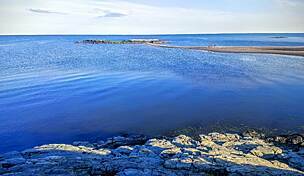 "I have always walked and biked the bridle trail. I guess that I follow in my Dad's footsteps. As a young boy he always was on that trail with the local Boy Scout group. The trail is full of wildlife and scenery. It is also full of history and lore. I find it a great place to visit to see how the towns were connected back in the early 1900's. Local towns had carrige trails that ran from town to the railroad. People would meet at the railroad to exchange goods and to travel. It is sad that the railroad is gone but it is nice that the pathway is still there. Recently I accomplished a round trip route on the trail in mid-november of last year. It was cold and damp but it was great to see other people on the trail biking, running, walking, and enjoying a lost link to the past. 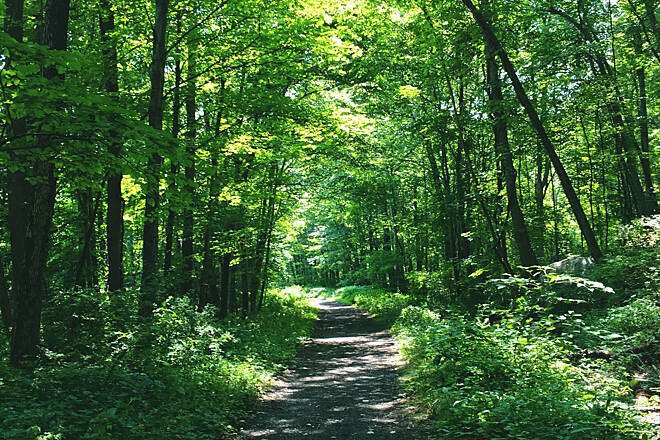 I would encourage anyone that loves the outdoors to check out this trail." "Starting in Southbure, we first missed the ""trailhead parking"" as the pine trees are so tall as to completely obscure the view of the tennis court. We ran into a local on an MTB who said the first few miles are always wet and we should start at the firehouse...his directions were a bit confusing so rather then get lost we ignored him and spent much of the the next half hour in cold, mosquito infested water. Once we got to the firehouse things dried out and the rest of the trail was well maintained rail to trail. Unfortunately I wasn't paying attention to the name of the road that the firehouse was on but you won't go too wrong if you drive about 2 miles farther down 67, take a left (north/east) and look for the trail....like most old rail trails it is hard to miss and there was parking by nearly every crossing...take the trail right--east--and you will do fine." "You can also pick up the trail on Christian st., near the airport. Many excellent singletrack trails lead off from there, although there is much development going on in the area. 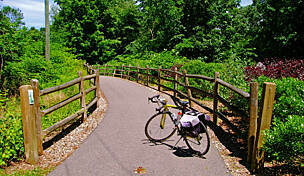 Hop brook park is at far east end with more mtb trails." 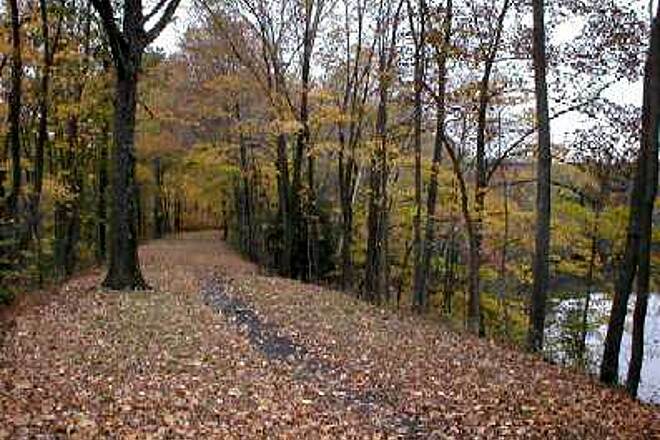 "The east entrance to this lovely trail is very difficult to find, but it's at route 63 in Naugatuck near the Waterbury line, and it has a steep (uphill), rocky introduction. Do not use a road bike on this trail. Mountain bikes only. And make sure to bring bug spray!"